I don't get to see as many of the Academy Award-nominated movies as I'd like. Since we were actually invited to an Oscars party this year, we thought we'd try and rent some of the Best Picture nominees that we'd missed on the big screen. It's a great excuse to snuggle up and eat some popcorn! 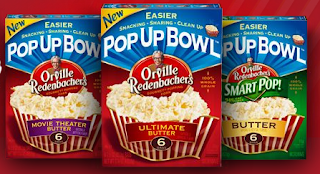 Our screening was sponsored by Orville Redenbacher Pop Up Bowls but, unfortunately, they are not available at our Walmart yet. In accordance to the FTC Guidelines and WOMMA Code of Ethics, I am disclosing that I was compensated by Collective Bias for my shopping and posting this review but all opinions are strictly my own. The movie does sound a bit dark, and like you, I think I'd be pretty confused. That is a really neat popcorn thingy! I have never seen one of those but what an excellent idea!